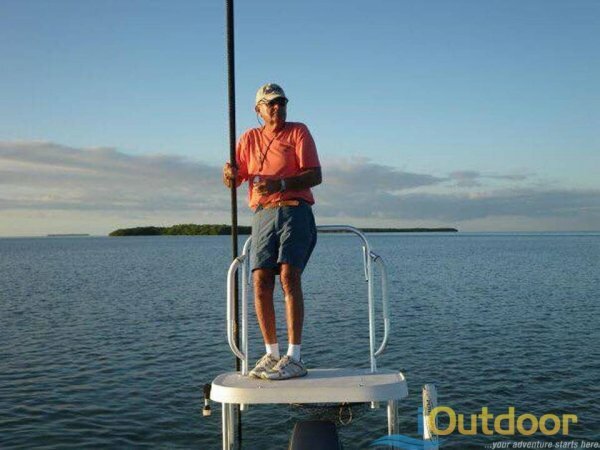 Hank Brown, revered as one of the best light-tackle fishing guides to ever prowl the flats of Islamorada and the Florida Bay backcountry, died late Monday. He was 86. Capt. Brown’s list of happy anglers includes former President George H.W. Bush, First Lady Barbara Bush and former Islamorada resident Ted Williams, who also played a little baseball with the Red Sox. “Hank was a great tarpon fisherman, one of the best ever in my opinion,” said Charlie Causey, an Islamorada angler who won the prestigious Don Hawley Invitational Tarpon Tournament in 1986 with Brown at the helm. The Hawley was the first major tarpon tournament to require releases, a position strongly supported by Capt. Brown. He was considered among Islamorada’s elite fishing guides, coveted by anglers as their skipper for limited-entry fly-fishing contests. Capt. Brown often is ranked among Keys fishing legends Jimmy Albright, Billy Pate, Cecil Keith and Eddie Wightman. A Maryland native, Capt. Brown left the business world to devote full-time to his fishing career that lasted for four decades. In 1982, he started selling his Hook Up lures, jigs specially designed for light tackle on flats and “skinny water.” The business continues under owners who sell the popular line of Capt. Hank Brown’s Hook Up Lures. Capt. Brown’s willingness to explore new waters of Florida Bay and chase fish anywhere earned him the good-natured moniker of Run Aground Brown. He was a longtime member and officer of the associations that worked on behalf of fishing guides and protection of the local waters. Hank Brown is survived by wife Joy, son Michael and daughter Michele. Details of a memorial service will be announced.